I’m finding it a little hard to believe that it’s already back-to-school time, but it’s true that summer is over and it’s time to head back into the classroom. Both of my boys have been gearing up for returning to their schools in the last few weeks, and me? Well, I’ve been working away coming up with lunches that will fill their hungry tummies after a long morning of learning. My kids have always been the type that like their lunches packed for them. It’s not that they are picky (OK, my youngest is), it’s just that there is something special about opening up a lunchbox packed with love by mom. While I’ve got my morning routine down pat and don’t mind making them an easy and delicious lunch, time wise, I do sometimes struggle with coming up with creations that I know they will enjoy to put in their lunch box. 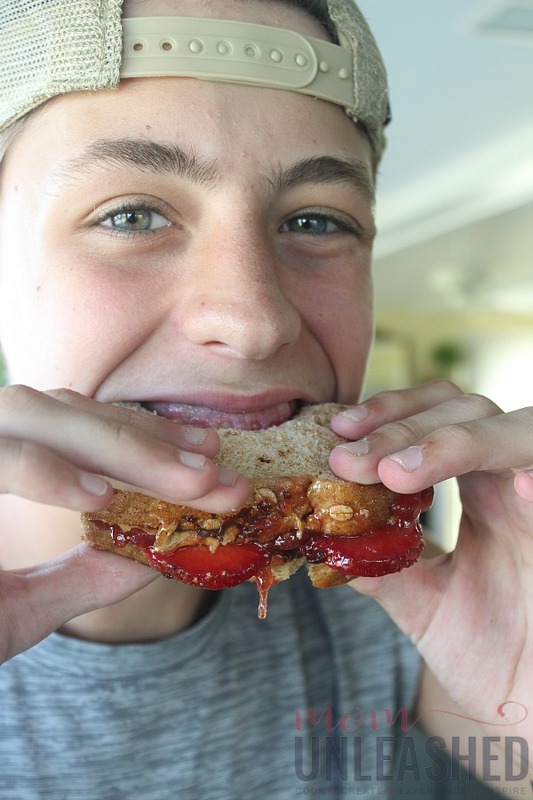 However, over the summer, we introduced my littlest to one of my childhood favorites, the Peanut Butter and Jelly Sandwich, and he loved it. 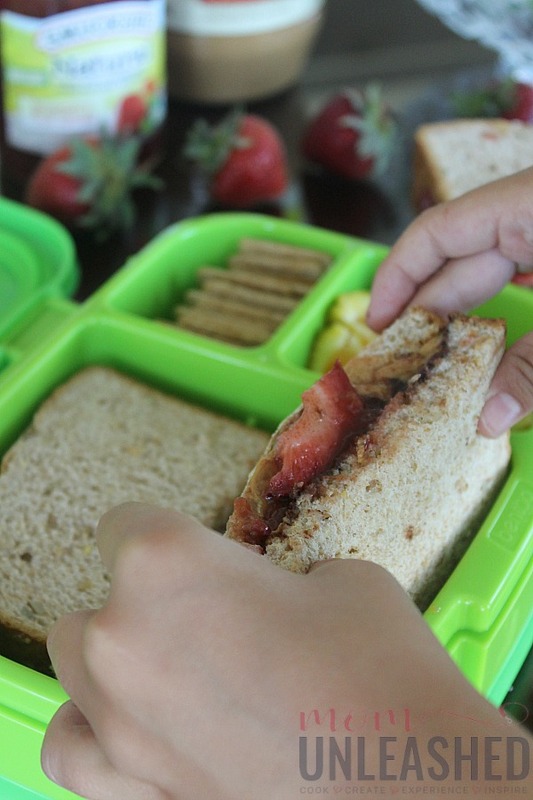 So, I’ve taken that love of this classic sandwich that both my boys have (I’m sure they inherited it from me) and created a fun, simple, and above all delicious Peanut Butter, Strawberry and Dark Chocolate Sandwich that is perfect for lunchboxes! Now, I will tell you that I’ve been eating peanut butter and jelly sandwiches for as long as I can remember. There is just something about the creamy peanut butter paired with the sweet jelly that makes it a great lunch option for any time. But when I think back to my favorite school lunches, the first thing that comes to mind is opening my lunchbox to find a note from my mom with a peanut butter and jelly sandwich under it. That’s why, as we did our back-to-school prep this year and I stocked my fridge with ingredients for school lunches, I made sure that I had plenty of Jif® Natural Peanut Butter Spread and Smucker’s® Natural Strawberry Fruit Spread from Walmart on hand. These two ingredients that bring back pretty much every amazing school lunch memory from my own childhood are just better together and help me to create lunches that my kids love to find in their lunchboxes. 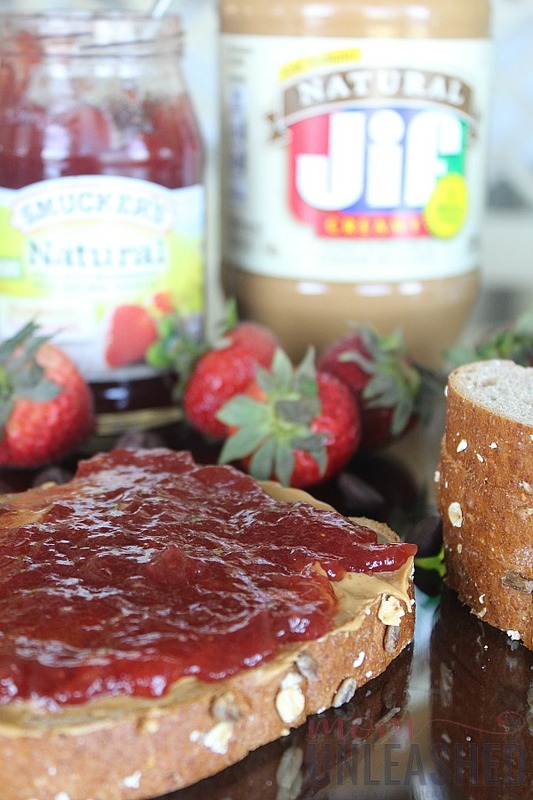 By pairing natural peanut butter and jelly (that I can feel good about giving my kids), with a few fresh ingredients and a sweet twist, I’m continuing the tradition my mom started by creating lunches that my kids love and that I can whip up quickly and easily for their lunchboxes. 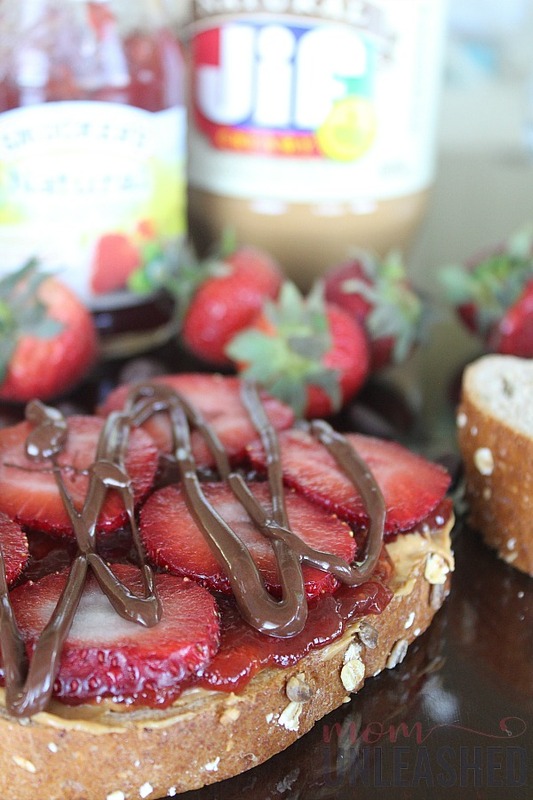 This Peanut Butter, Strawberry and Dark Chocolate Sandwich takes the traditional PB & J and gives it a delicious twist! Spread the Jif Natural Peanut Butter Spread onto a piece of bread. Slice the fresh strawberries and place them on top of the Fruit Spread. Melt the dark chocolate chips for 30 seconds in the microwave and drizzle them over the fruit. Add the top piece of bread, slice and place in a container or bag. Pair with fresh fruit, crackers and juice for a perfect school lunch. 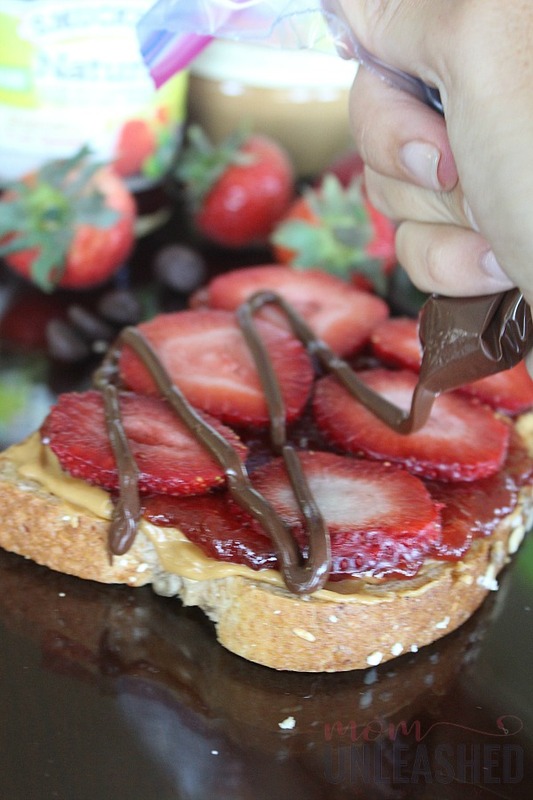 While I’m always going to love a classic PB & J sandwich and its simple deliciousness, you all know I love to give everything my own spin and in my mind, nothing complements Jif Natural Peanut Butter Spread and Smucker’s Natural Strawberry Fruit Spread better than some fresh strawberries and a little dark chocolate drizzle! Are you drooling yet? You will be because this ain’t your mama’s lunchbox creation and I can guarantee that while it will bring back memories of your own childhood, it will also be your kiddos favorite new school lunch! 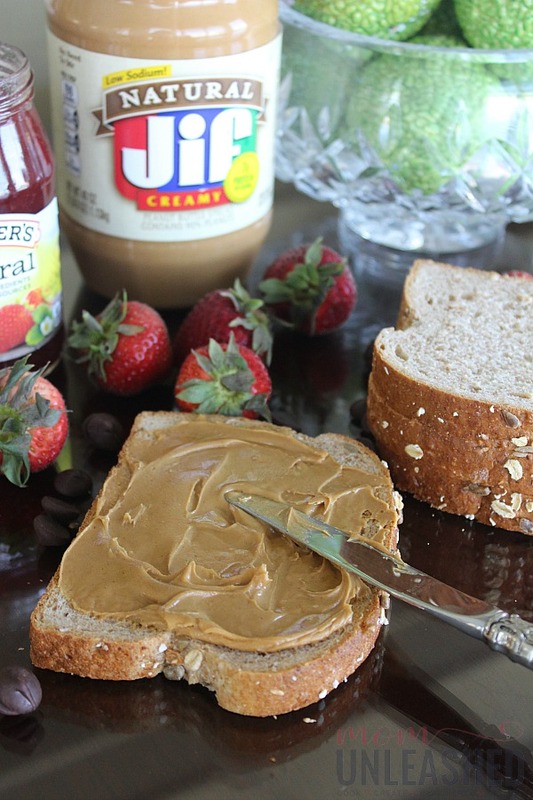 To start, I lay out my bread slices (these Peanut Butter, Strawberry and Dark Chocolate Sandwiches are easy to make in batches for multiple kiddos) and spread on my Jif Natural Peanut Butter Spread! I’ve always loved that Jif goes on so smooth and now with a natural option that’s made with 90% peanuts, I can feel even better about what I’m putting in my kids’ lunchboxes! 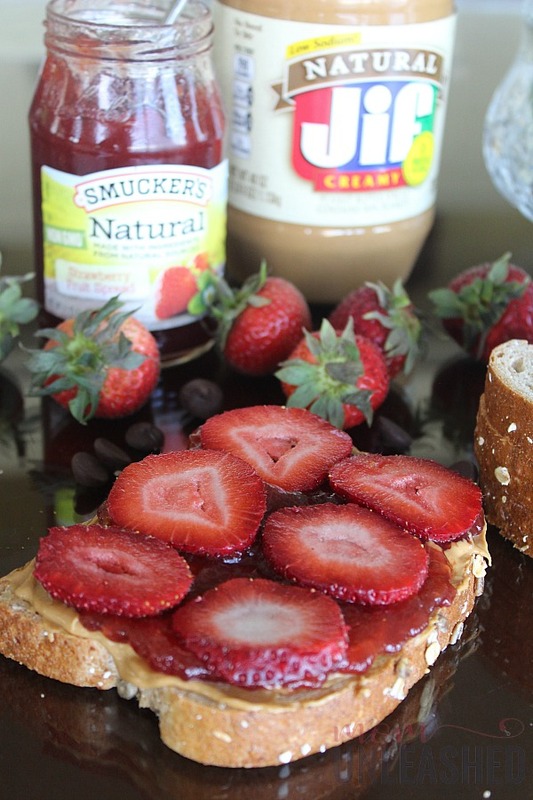 Once I’ve spread on my Jif Natural Peanut Butter Spread, I top it with Smucker’s Natural Strawberry Fruit Spread. This non-GMO fruit spread that is free of preservatives has the classic strawberry flavor that’s perfect for a PB & J sandwich! 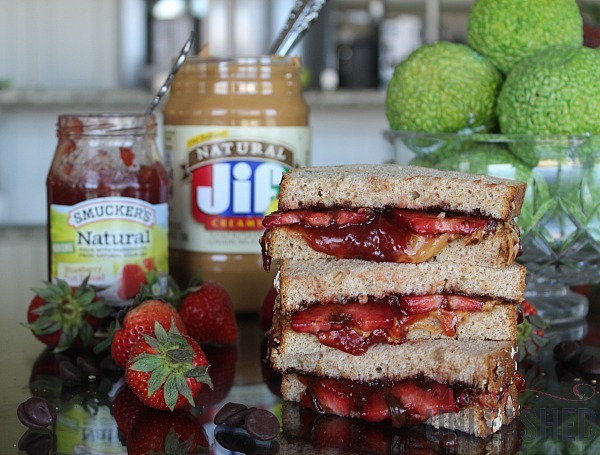 Now, this is where the traditional PB & J sandwich gets a little makeover to transform it into my Peanut Butter, Strawberry and Dark Chocolate Sandwich. I quickly slice my fresh strawberries and add them in a thin layer to the top of my Smucker’s Natural Strawberry Fruit Spread. Now, I know you’re thinking strawberry on strawberry is just overkill but I promise it’s not! It’s perfection! Once my sliced strawberries are in place, I melt my dark chocolate and drizzle it over the top for a surprising twist that my kids absolutely adore. After adding on my top piece of bread, I slice my sandwich in half and have a perfect new twist on the classic PB & J that I loved in my own childhood. Once I’ve paired my Peanut Butter, Strawberry and Dark Chocolate Sandwich with some fruit, a few crackers and a drink, I’ve got everything I need to pack a back-to-school lunch that I know my kids will love and that I can feel great about sending to school with them. Gone are my days of worrying about them being hungry or leaving behind one of my creations in their lunchboxes, and here to stay are the days of lunches that disappear while creating the same nostalgia towards PB & J that I have from my own childhood! 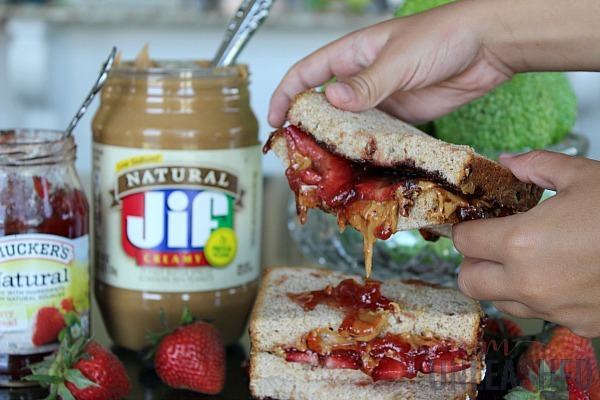 As you prepare your kids for back-to-school, make sure you’ve got the easiest and tastiest lunchbox ingredients on hand by heading to Walmart to pick up Jif Natural Peanut Butter Spread and Smucker’s Natural Strawberry Fruit Spread. 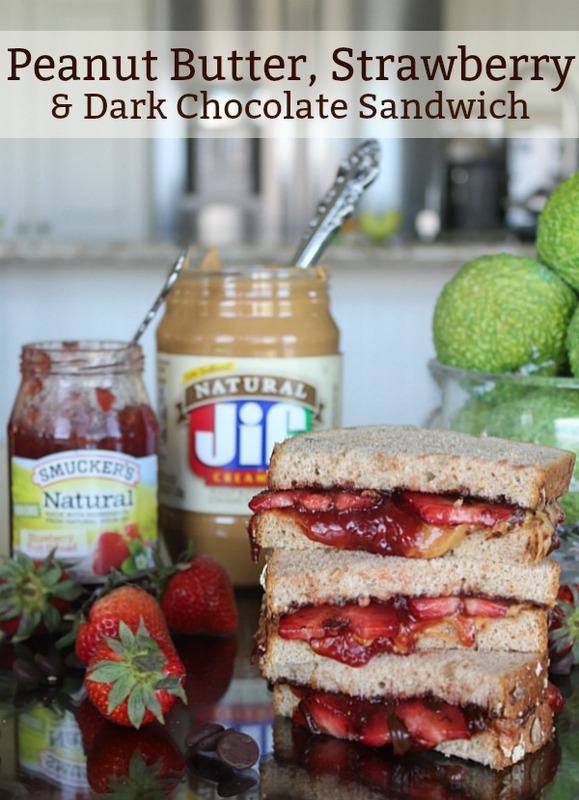 Then use it to make a classic PB & J, whip up my delicious, kid-approved Peanut Butter, Strawberry and Dark Chocolate Sandwich or use it as inspiration for your own awesome creation! 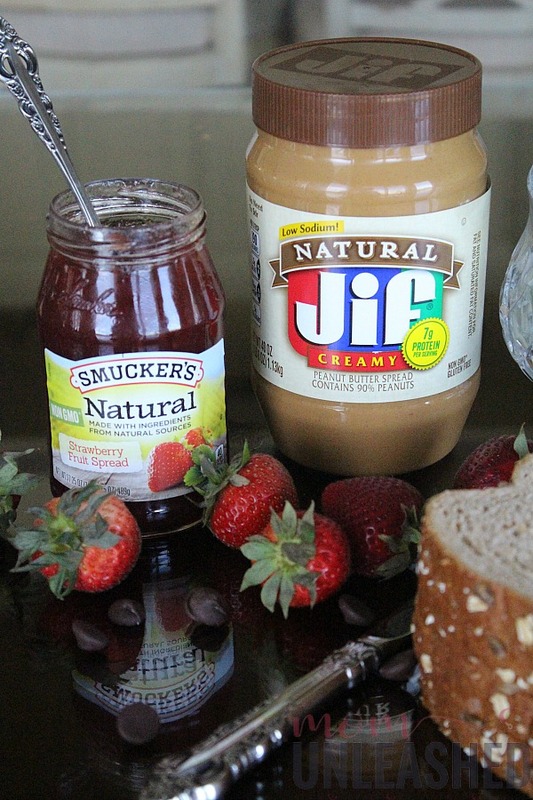 The truth is, no matter how you serve it up, Jif and Smucker’s are the perfect combination for amazing back-to-school lunches for kids of every age. Now tell me, how will you use Jif and Smucker’s products from Walmart to create better back-to-school lunches this year? Now this looks like an upgraded peanut butter and jelly sandwich. Going to make this for everyone in the family. Guessing it will be a big hit. I’ve always enjoyed a peanut butter and jelly sandwich and I really like your twist on the original. I mean, chocolate and peanut butter are a match made in heaven. Add strawberries and I’m all over this sandwich. It looks amazing! This sounds crazy good! I want to try it on toast…. I love toast so much. This combination makes me swoon thinking about it on warm bread! Yes please! This is my kind of sandwich. My kids would love it as well. You can’t go wrong with adding chocolate! Seriously, didn’t summer just start? How can it be back to school already? These sandwiches look delicious! I love the addition of fresh strawberries, and you really can’t go wrong with dark chocolate! Pick me up off the floor. Chocolate makes everything taste so much better and this really looks good. Must try. Why have I never thought of this! Dark chocolate on a sandwich would be delicious! I absolutely need this in my life! I have a weakness for peanut butter and jelly sandwiches, and the thought of adding chocolate into the mix is almost too much to bear. Yum! This looks like the most incredibly delicious PBJ ever! I would totally use crunchy peanut butter to add some texture! An interesting and tasty looking sandwich. I haven’t tried this flavor before but I bet it tastes absolutely taste. now that is an interesting combination. And all flavors I like. I am going to try this and see my daughter likes this for lunch option!! My kids are not much into sandwiches. My husband however would love these combinations. That is like the ultimate pb&j sandwich! I would have never though to put chocolate in it! What a delicious sandwich and perfect for back to school. I need to try this for the kiddies! Love the addition of the chocolate to that classic favorite! It’s nice to have lunch made by mom! It feels so good especially if they’re stressed out from all the learning. This is a lovely lunch idea! This is an awesome lunch idea! I love peanut butter and jelly and to add a drizzle of dark chocolate would make it even better.